The Mind Sword - WMC Toys - William Mark Corporation - Feisty Pets, Air Swimmers, X-Zylo and more! Lights up as objects Magically Rise to Your Hand! The Mind Sword - Mystify your friends with this amazing illusion! Mystify your friends with the amazing illusion of the Mind Sword! Move objects with your mind! 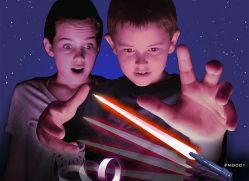 Make the glowing sword fly into your hand! Levitate the Mind Sword out of a glass! Learn many tricks quickly by watching the instructional video (secret access code inside this package)! Mind Sword Owners: If you have purchased The Mind Sword™, enter the secret password found on the instructions inside the package to to view an instructional video and learn some amazing advanced tricks and techniques! Click here.